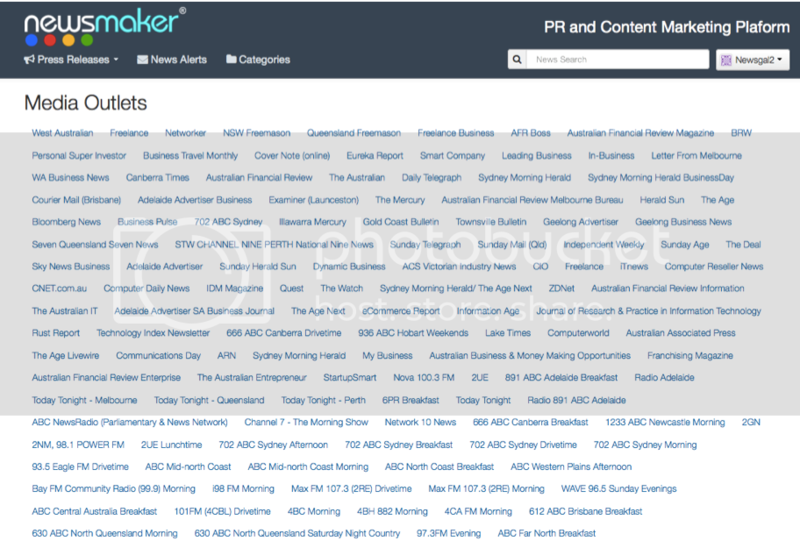 NewsMaker® has made it as easy as possible to filter our list of over 10,000 Australian and New Zealand journalists and bloggers. You can build a Media List from within the Press Release Template and it will be saved to your list of Media Lists. Or you can build a Media List separately by opening your 'list of Media Lists' at the top left of the page, in the dropdown menu just below the logo. (3) Select the Media Outlets and Save. 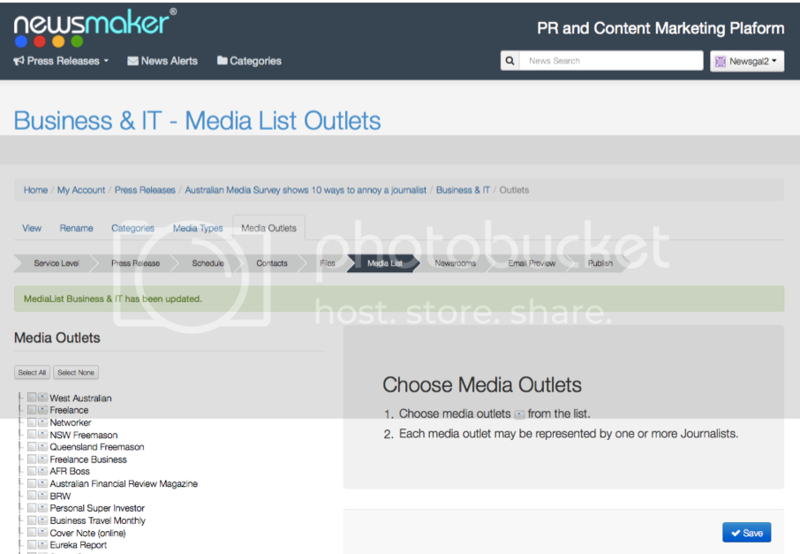 You can use any Media List you build now for future Press Releases. 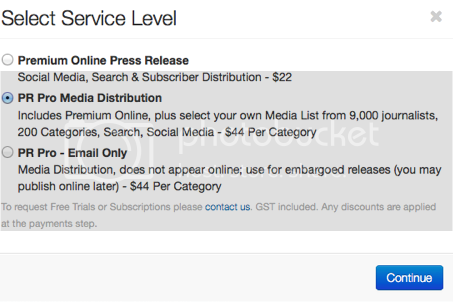 Select the PR PRO Service Level. If you want to embargo the release - that is, send it early to journalists - before publishing online, select PR PRO - Email Only. 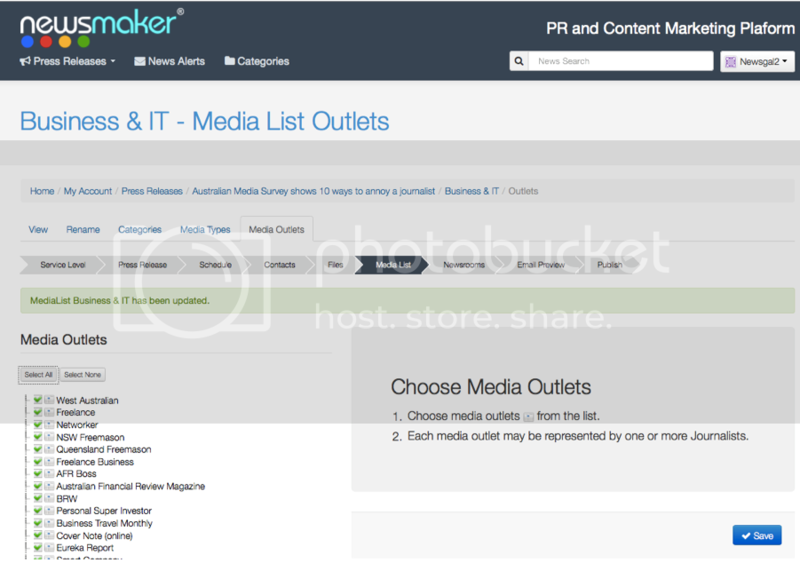 In the Press Release Template, select a Media List you saved earlier or click Create Media List. You can also edit an existing list by clicking the tiny magnifiying glass next to the list name and reselecting Media Categories, Regions, Types and/or Outlets. Whatever method you choose, you need to click "Save & Continue" to save the list to the current Press Release. 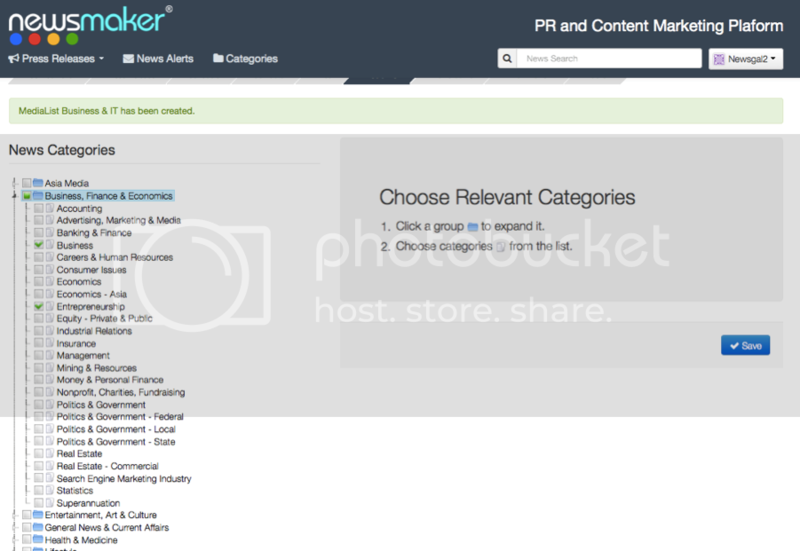 Click the 'arrow' next to the Group Heading to view and select the Media Topics/Categories in that Group. Choose the Regions - by State or National - you want to reach. Note that "National" publications excludes outlets that are purely State-based. The Australian and Cleo are good examples of National. 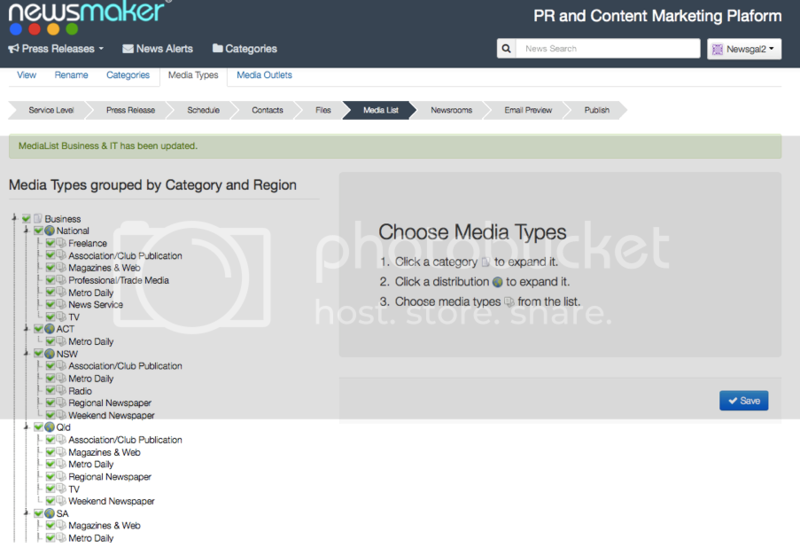 Choose the Media Types within each Region. Choose carefully so you can use this Media LIst again. Select All to select all the Media Outlets. Then edit the Outlets so you make sure you don't send anything irrelevant to the journalist's beat. Unselect All to start again. Better to do this now and get it right than to keep sending releases journalists don't want. Each Media Outlet and the Freelance Category will contain many journalists. Here's an example with all Media Outlets selected. 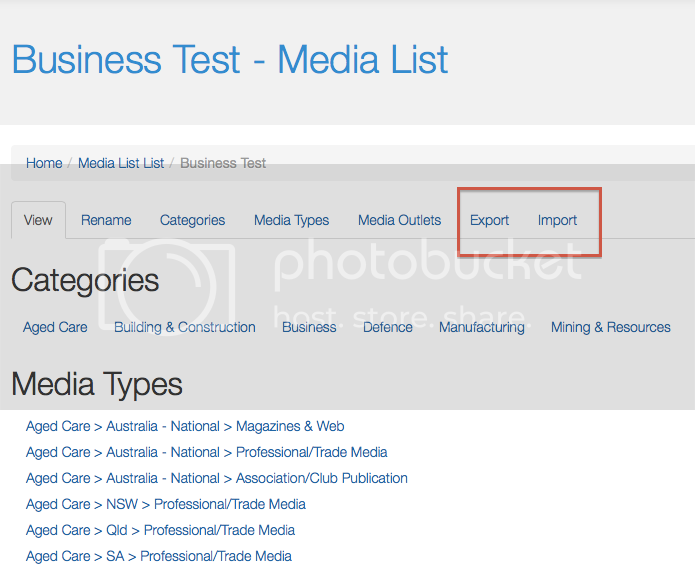 Don't forget to save again when you are returned to the Media List page in the Press Release Template. 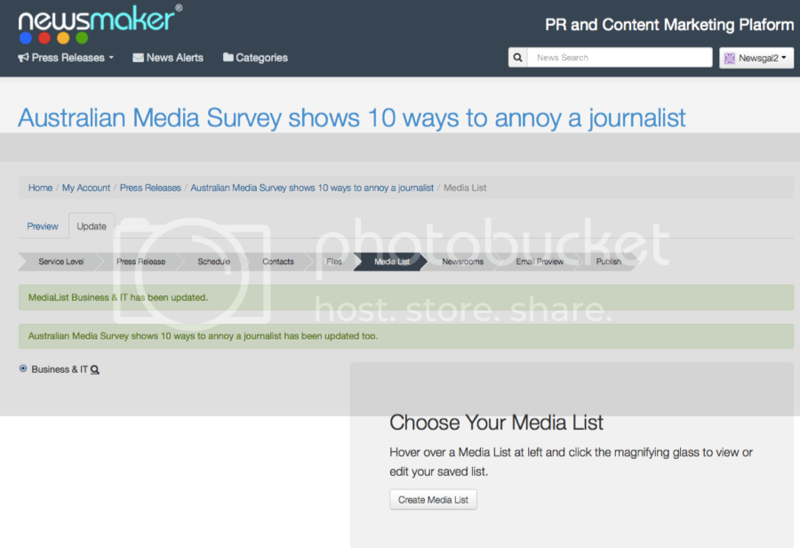 A new feature allows NewsMaker to export your Media List or import your own Media List. 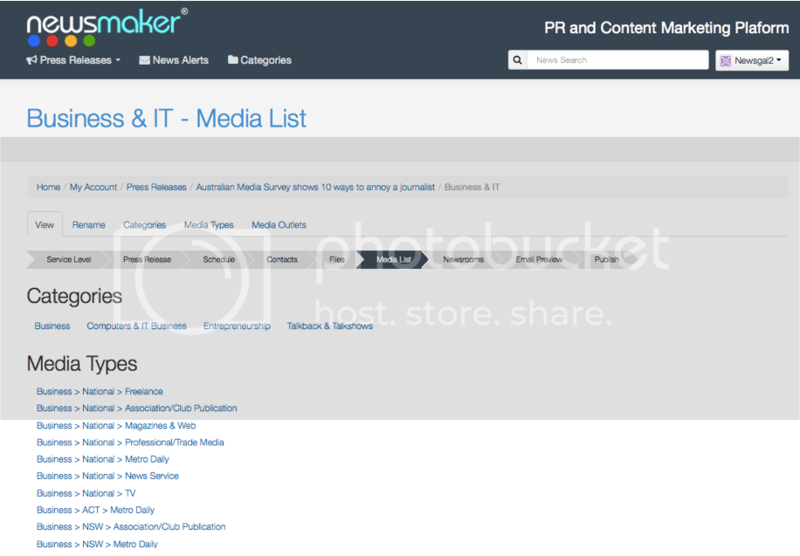 When you click the magnifying glass next to your Media List name in the Press Release Template, here's what you'll see. Scroll down to see the full Media List (see next caption). To return to the Press Release Template page, click the "MEDIA LIST" tab. Here's what you see when you scroll down the page in the Press Release Template; or when you open your 'list of Media Lists' at the top left of the page, in the dropdown menu just below the logo. You can also cut and paste this list into a spreadsheet. 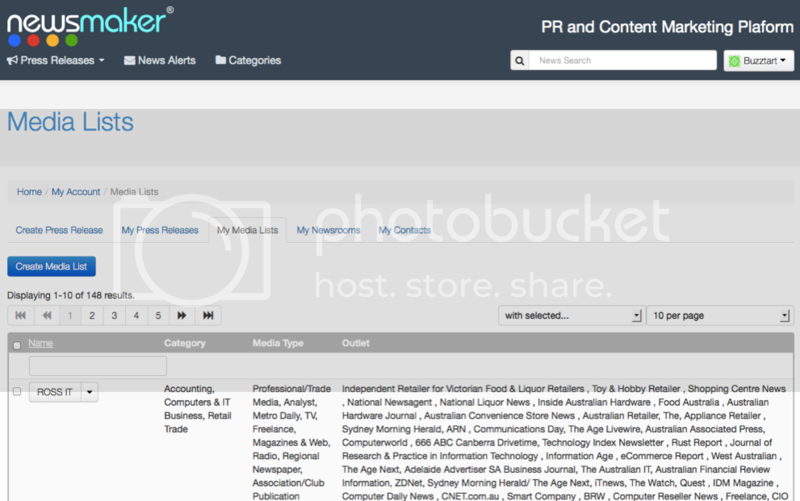 After press release distribution, when you click on your Media List you can see all the Media Outlets in this view. You can use the tabs just above this list to edit News Categories, Media Types and Media Outlets. You'll be prompted to re-save the list when you next send to a new Press Release.